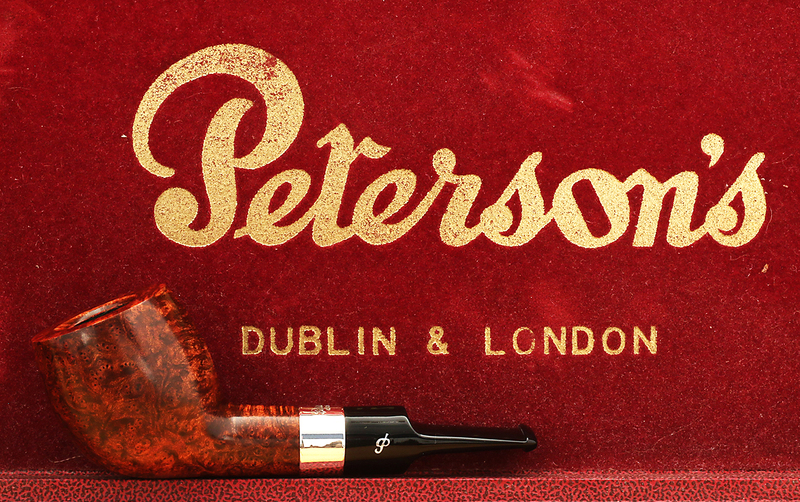 Here it is, at last — the 21st annual Peterson Pipe of the Year! Formerly known as the “Limited Edition,” and extending back 1997, if I’m counting right, this is the 22nd pipe to be released in this series (since Y2000 was a pair). Just a little background to give some context to this year’s pipe: Peterson “shifted gears” back in 2014, as some of you know, so this is the 4th new-generation POTY. 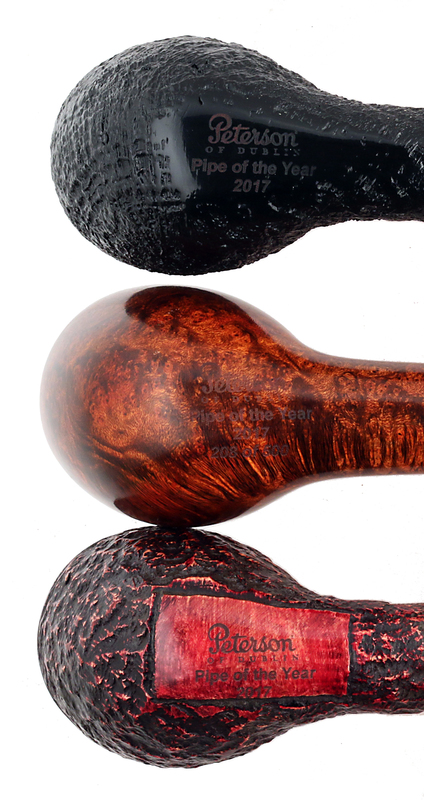 The 2014 POTY was the first to be available only with an acrylic stem, and to bring a slightly different aesthetic than the 1997 – 2013 pipes. 2014 was also the last year the POTY was offered in a numbered series of 1000. 2015 was Peterson’s celebration year, so a bit of a time-out for the POTY, being the year of the Founder’s Edition and a return to the grander visions of earlier POTYs. 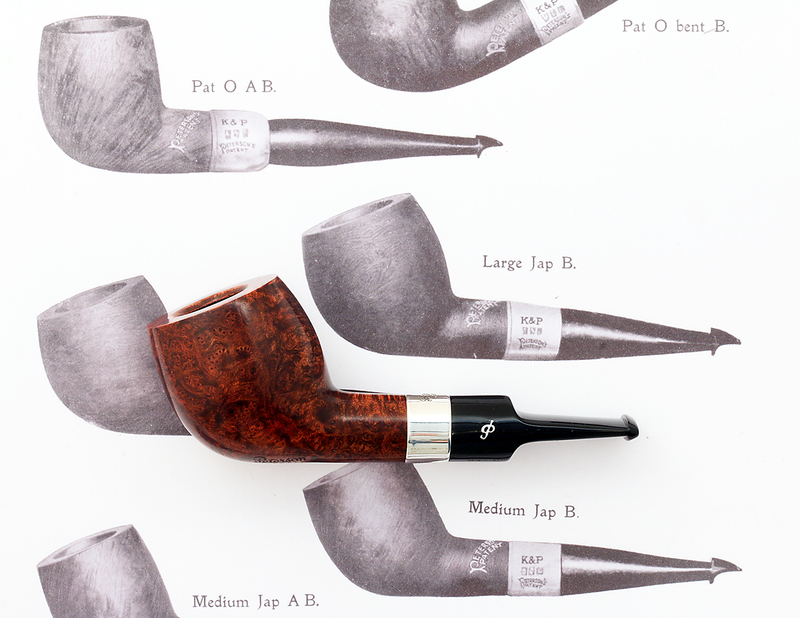 It was made available in vulcanite P-Lip and fishtail acrylic, with a beautiful gift box and in an edition of 1865 pieces, to celebrate the earliest documented date of Kapp & Peterson. The large number has had the side-benefit of the pipe still being issued in small numbers – in fact, I just recently found my own smooth P-Lip after a long search. 2016 was the first year the line was reduced to 500 pieces, making it scarcer – which is sort of the idea behind a POTY, isn’t it? More importantly, it was the first time the POTY was issued in a non-XL size and without a gift box. But I’m not complaining, as it’s among the most original of all the POTY shapes, and a personal favorite in my rotation. There appears to be greater thickness to the 2017 POTY chamber walls as well as a beveled rim – both improvements over the original, to my mind. The 2017 also has a very slightly longer shank. The stems of the two pipes are the same length. The wide saddle bit is quite comfortable, as I knew it would be from smoking Italian chubbies of similar dimensions, making the acrylic a decided plus for me, as I won’t have to keep after it with Obsidian oil to keep it black. 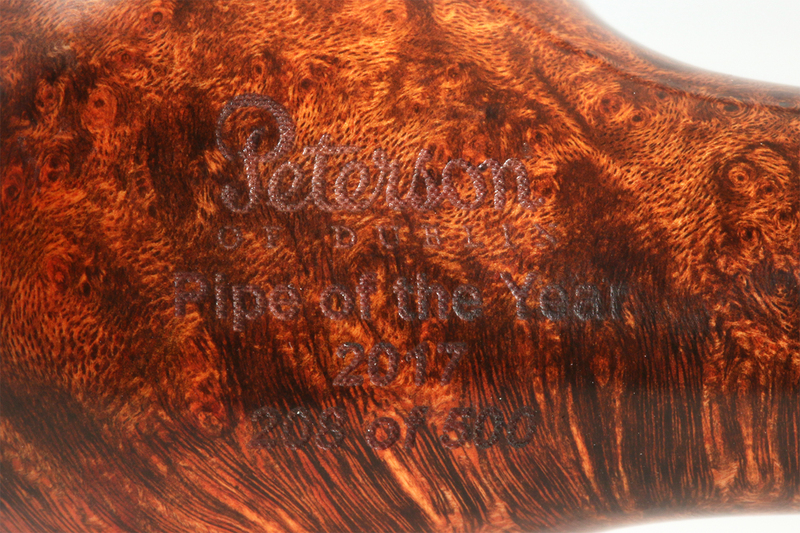 This year’s pipe is laser-stamped on the bottom, with only the smooth bowls being numbered, as has been Peterson’s practice on all the POTYs (aside from the Founder’s Edition). 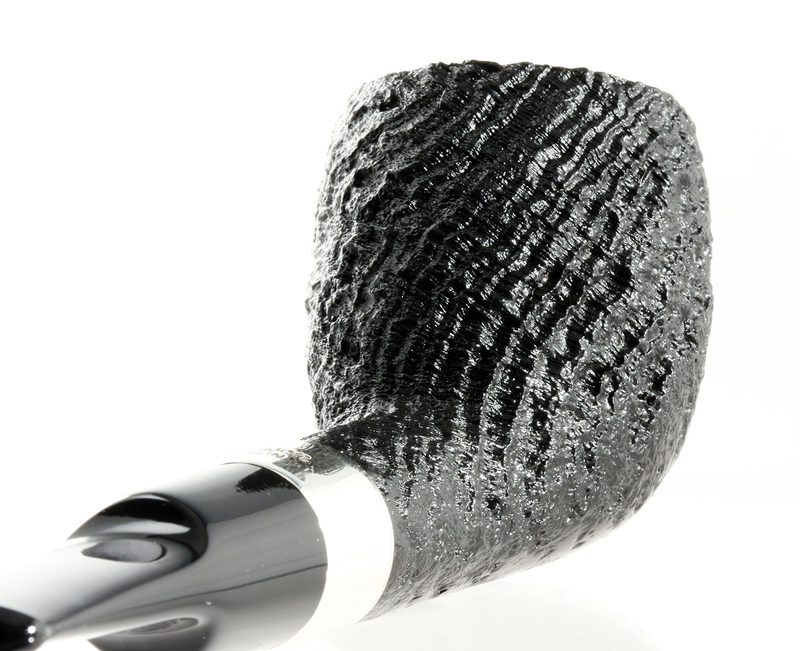 The pipe feels good in the hand, but do take notice of the forward-cant of the bowl. It’s not a problem for me, but you should know you won’t be able to see the flame light the tobacco. If you smoke a B35 (the antique Kaffir reproduction) or the 268 Bent Albert (what Pete Freeks call the zulu shape), this won’t be a problem. 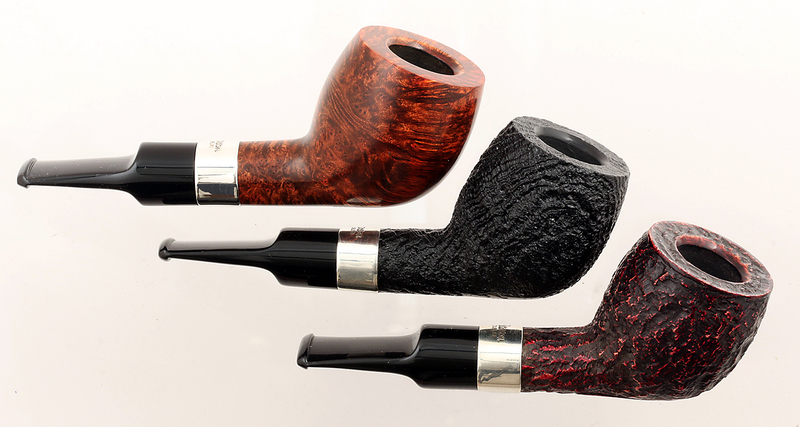 The chamber geometry is a steep V or cone, what some called “triangular,” much more so than my Peterson Dublin 120s. I haven’t smoked this pipe enough to tell you how it performs, although that always varies quite a bit from user to user. I will say that after the 309, my next favorite Pete bowl shape is the 120, as it requires very few relights as compared to a traditional billiard, so that I’m hoping for something similar from the new POTY. Length: 127 mm. / 5.00 in. Weight: 48 gr. / 1.70 oz. Bowl Height: 48.97 mm. / 1.92 in. Chamber Depth: 41.07 mm. / 1.61 in. Chamber Diameter: 18.59 mm. / 0.73 in. Outside Diameter: 39.43 mm. / 1.56 in. Weight: 47 gr. / 1.65 oz. Chamber Diameter: 18.28 mm. / 0.71 in. Outside Diameter: 38.75 mm. / 1.52 in. Weight: 46 gr. / 1.60 oz. Bowl Height: 48.61 mm. / 1.91 in. Chamber Diameter: 18.43 mm. 0.72 in. Outside Diameter: 40.23 mm. / 1.58 in. While you’re waiting for the right 2017 POTY to appear in your mailbox, here’s something else to think about: an 18K gold cap and band rustic 307! Kris told me about it over at Black Swan in Surrey, and I didn’t believe it until I saw it with my own eyes. 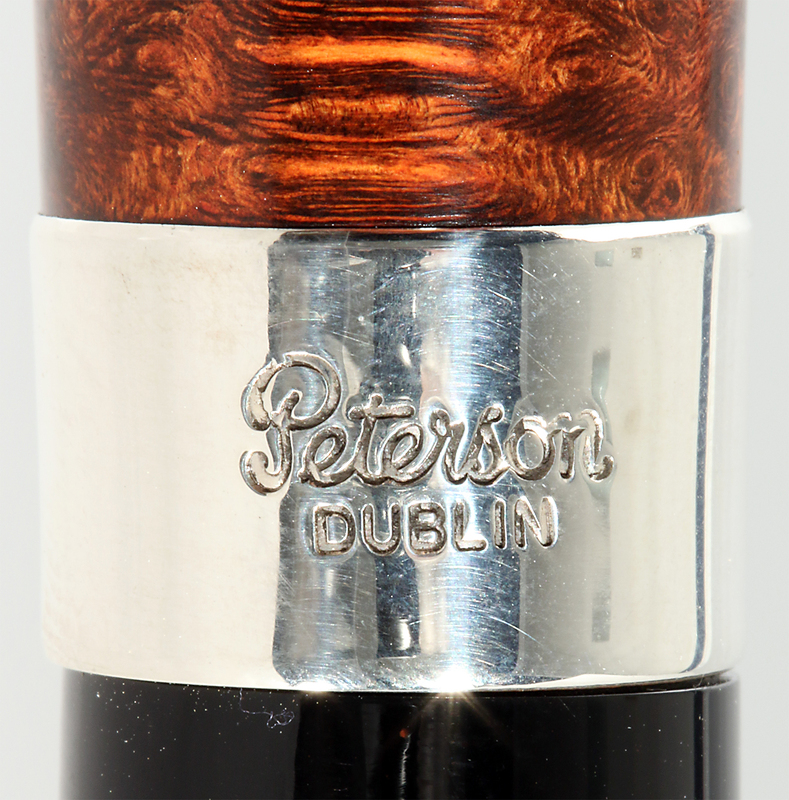 It’s a one-off unlike anything you’re ever likely to see in the world of Peterson pipes. The 307 is shape 9 from Charles Peterson’s original Charles Peterson Patent designs in the 1896 catalog, in production for over 120 years. Kris is a deep-down lover of all things Peterson, as you know if you read the last blog on the Peterson Plato shape. You can read the story of this pipe’s creation at the link below. At the time of this posting, it is still available, should you decide to add it to your collection. Tell Kris you saw it here! I ordered a smooth which should be here by next week. I’m really looking forward to it. There was no sandblast available or I may have bought it as well. For now I can simply keep reading this post to my anticipation at bay. Update us when it’s arrived. I’ve never seen a Peterson chamber with this shape before, so I’m hoping you can shed some light on it. Arrived this morning — Dublin to Syracuse. The bird’s eye on my 9mm smooth guy is outstanding! I’m looking for a way to make it possible for you to upload photos like the one you sent to my email in the comments here. May have to wait until summer, but I think everyone would find it useful. Great grain on your 9mm, BTW! I got my 103/500 on 26. april 2017 and 3/500 is on the way.Currently it is at the Post in Copenhagen Airport. I have added nr 91/500 to my stock, this one have the best grain. Nr 103 is a very good pipe to smoke. I recently received a Kapp Royal version of the 2017 Pipe of the Year shape–same bowl/shank combo but fitted with a long, dark red/brown swirl fishtail stem, rather than the yellow/marmalade version. This pipe shape is marked as D21. I can’t find any information about a “D21” shape other than one old post showing a Peterson Tankard-shaped pipe identified as a D21–but no corresponding photo of the shape stamp on that pipe. Do you think D21 is the shape style for the 2017 Pipe of the Year moving forward? To be clear, this bowl was sold as a D21 pipe, not a POTY. It is, however, identical to the POTY. Any thoughts? 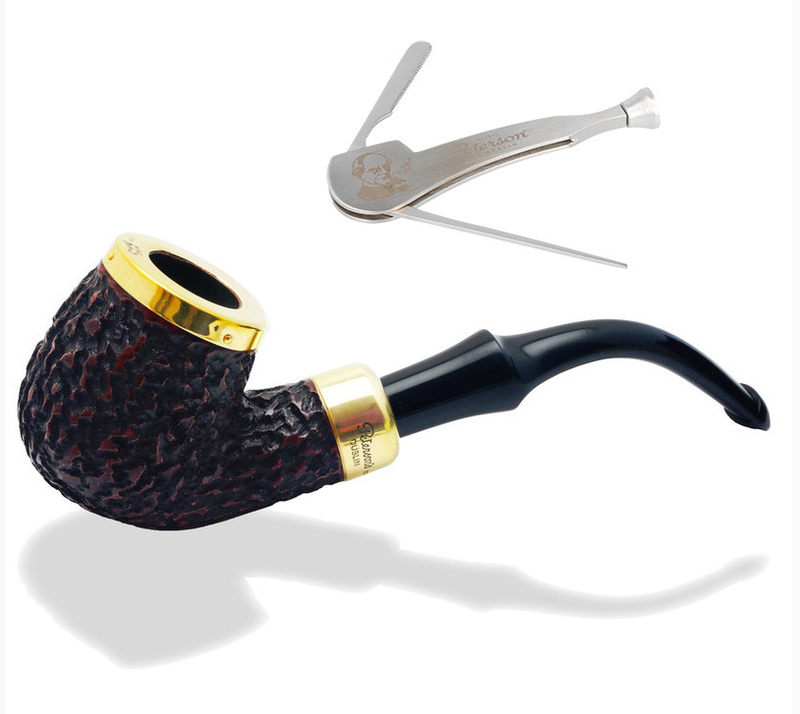 It’s a beautiful pipe, though my preference would have been for the marmalade stem, rather than the dark cumberland. The D21 is, indeed, the 2017 POTY. The new 2018 POTY is the D22. The tankard I think you are referring to was originally part of the 2010 Mark Twain set and was marked “LT” or “Large Tank” to facilitate Italian sales of the non-MT versions. It was then given number D19. D20 was the Founder’s Edition. As for “thoughts,” you’ve got a bowl that is superior to the 2017 POTY, hand-picked for Mario Lubinski, the Italian distributor for Peterson. You are, in short, a lucky man. Thank you: you’ve an endless supply of helpful information. I do feel lucky to have the D21. The bowl shape appeals to me–I’ve picked up each of the 2017 POTY finishes, but his one was too good to pass up. Between this and the B23 shape, I’m hard pressed to pick a favorite. Thanks again for your reply!